When sixteen-year-old Jean Faut (rhymes with “out”) read reports of the widespread destruction inflicted by Japanese naval and air forces at Pearl Harbor on December 7, 1941, she had no idea the war would change the lives of hundreds of thousands of American women, herself included. In fact, besides the important war work typified by “Rosie the Riveter,” the All-American Girls Professional Baseball League, created in 1943, offered hundreds of women the opportunity to play professional hardball. Faut, a third baseman who became a right-handed pitcher, gave the All-American League and the fans eight excellent seasons. Jean performed so well she was chosen an All-Star four times and Player of the Year twice. As a hurler, she produced a lifetime record of 140-64 with a 1.23 ERA in 235 games. Her career earned run average was the lowest in league history. Perhaps more important, Jean in many ways typified the quality of athlete and the type of woman who helped make the league successful during its twelve-year history. In the spring of 1946, the All-American League’s fourth season, Faut traveled by train from her home in East Greenville, Pennsylvania, to Pascagoula, Mississippi, to try out for the All-American, as players and fans often called it. During spring training in the early years, the league allocated the players to teams for the purpose of maintaining a competitive balance. Faut, who was 21 on January 17, 1946, had no previous professional experience, but she had pitched batting practice and in exhibitions against the semipro team in her hometown. Assigned to the South Bend Blue Sox, she became known as the league’s best overhand pitcher. Although no character based on her exploits appeared in the 1992 movie A League of Their Own (none of the movie’s characters represented actual players), Hollywood easily could have picked the sandy-haired, blue-eyed beauty for a leading lady. Faut’s impressive achievements included hurling four no-hitters, two of which were perfect games. Her first perfect game was a 2-0 masterpiece against the defending AAGPBL champion Rockford Peaches on July 21, 1951. She repeated the rare baseball feat in her next-to-last performance, a 4-0 gem at Kalamazoo against the Lassies on September 3, 1953. Nobody else hurled a perfect game after the All-American League shifted to overhand pitching in 1948. During recent years the All-American League has received more recognition, thanks in part to the Players Association and its web site. But in the 1940s and the early 1950s, baseball was viewed as a male’s world. Most of those who played the national pastime did so mainly for the love of the game and for the privilege of being big leaguers. But the same was true for the more than 600 females who played in the AAGPBL. The league originated during World War II. Chicago Cub owner Philip K. Wrigley and his associates devised a plan for skilled and attractive “All-American” girls to play hardball in short dresses on teams accompanied by female chaperones. The AAGPBL evolved through many stages, including shifting from underhand to sidearm to overhand pitching; lengthening the distance to the pitcher’s mound and between the bases; and decreasing the size of the ball—from 12 inches in circumference in 1943 to 9 1/4 inches (regulation baseball size) in 1954, the final season. Baserunners, however, could lead off and steal from the league’s first year, so the game was always fast-paced. Born on January 17, 1925, the second oldest daughter of Robert and Eva Faut, Jean, two sisters, and three brothers grew up during the Great Depression in a working class family. The energetic girl developed a love for sports of all kinds, especially baseball. In a 1996 interview, Jean remembered spending hours throwing rocks at a telephone pole, which would later help her pitching control. Attractive, enthusiastic, and talented, with strong arms and wrists, she had an excellent mind for figures. During AAGPBL games, she memorized her pitching pattern to each batter so that she did not throw the same pitches in a later at-bat. East Greenville fielded a semipro baseball team, the Cubs. By the mid-1930s Jean was hanging out with friends at the ballpark. Seeing her interest, the team’s second baseman taught her to throw different pitches. As a result, Jean (unlike most All-Americans) never participated in fast-pitch softball, the nation’s most-played sport during the 1930s. Greenville High, starring in field hockey, basketball, and track. She graduated in 1942 and worked in a clothing factory in nearby Pennsburg. Later, at a knitting mill, she earned $25-$30 a week, a typical worker’s pay for the era. Faut never knew about the AAGPBL until an Allentown scout, who heard of her reputation for pitching in semipro exhibitions, contacted her early in 1946. She received the scout’s call and then a train ticket. In April, despite her mother’s opposition, Jean traveled to the All-American’s tryout camp—held in Pascagoula in 1946. At spring training the team managers and officials observed over 200 rookies and returning players, putting them through tough workouts on diamonds at an abandoned naval base near the Gulf of Mexico. Two weeks later, with 17-18 players allocated to each of the league’s eight teams, four pairs of ball clubs barnstormed their way north playing exhibition games to prepare for Opening Day on May 22. Six teams competed in the league’s 110-game 1945 regular season, finishing in this order: the Rockford Peaches, the Fort Wayne Daisies, the Grand Rapids Chicks, the Racine Belles, the Blue Sox, and the Kenosha Comets. In the best-of-five Shaughnessy Series playoffs, runnerup Fort Wayne defeated fourth-place Racine in four games, first-place Rockford eliminated third-place Grand Rapids in four games, and Rockford won the league championship by beating Fort Wayne in five games. For 1946 the All-American added the Lassies in Muskegon, Michigan, and the Redwings in Peoria, Illinois. Other changes included decreasing the ball’s size from 11.5 inches in circumference to 11 inches, moving the bases to 70 feet apart (from 68 feet in 1945), and moving the pitcher’s mound to 43 feet (instead of 42 feet) away from home plate. Compared to the AAGPBL, men’s softball used a 12-inch ball, 60-foot basepaths, and the same pitching distance. Later in 1946, the league allowed a below-the-waist sidearm delivery. The new rule led many pitchers to add a curve or sinker to their fastball, curveball, and change-of-pace, all of which Jean threw before she joined the league. Faut enjoyed a good first season. South Bend took third place with a 70-42 record but lost in the playoffs to Rockford. Faut played 101 games, mostly at third base, batting .177. She had 61 hits in 344 at-bats, scoring 37 runs, and—since she often hit best in the clutch—producing 40 RBI. While her batting average seems low, Faut had never batted against underhand pitching. Also, the Blue Sox as a team led the league with a .220 mark in 1946, but more than half of the circuit’s players averaged less than .200. Among starters, only Dottie Kamenshek (.316) of Rockford hit over .300. Actually, the All-American was still playing fast-pitch softball, but with a smaller ball—which gave a definite advantage to the faster underhand pitchers. South Bend manager Chet Grant, once Notre Dame’s backup quarterback during the Knute Rockne era, sent the strong-armed Faut to the mound when the sidearm motion was approved in 1946. She started nine games, completed eight, and finished three. In 81 innings she fashioned an 8-3 record with a 1.33 ERA, and she tossed a pair of two-hitters. After playing her rookie season for $65 a week, Faut signed in 1947 for $85. Salaries at the time ranged from $55 to $125, so she was well paid. Former Daisy Vivian Kellogg remembered signing for $75 a week when she first joined the league in 1944, and that figure doubled her pay as a Bell Telephone operator. Viv recalled her salary being more than what her father earned. The big adventure of 1947, recalled fondly by many players, was a spring training jaunt to Cuba. The league flew 150 young women from eight clubs to Havana, where they trained, played eight days of exhibitions, and were cheered by more than 75,000 fans. During the regular season South Bend finished fourth, and Faut enjoyed another good year. In 44 games she pitched a personal-high 298 innings, compiling a 19-13 record with a 1.15 ERA. She batted .236 in 56 games, ranking 19th in the league. 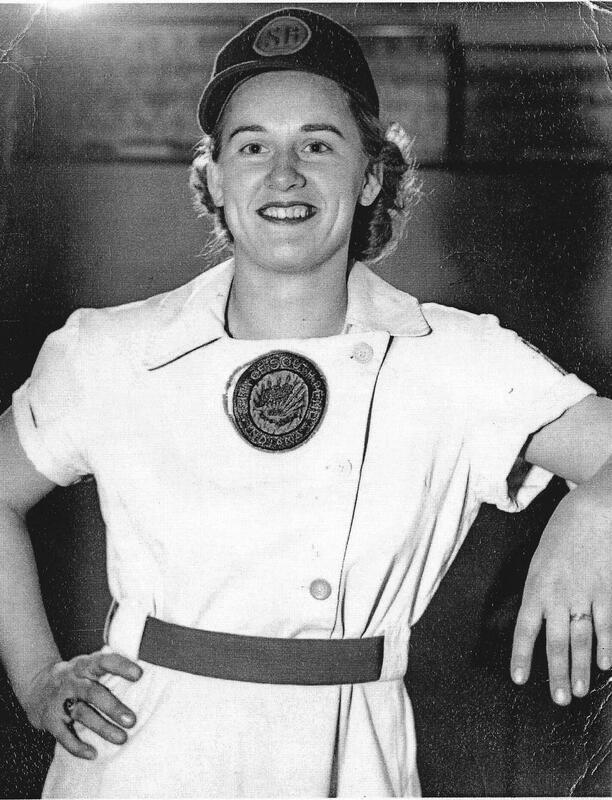 Dot Kamenshek again led the AAGPBL, this time averaging .306. Faut’s most durable performance came on July 31: South Bend outlasted the Racine Belles and Eleanor Dapkus in 22 innings, 4-3. Jean pitched the entire game, spacing 16 hits, striking out 11, walking five, and contributing two hits. South Bend’s star center fielder Betsy Jochum remembered that game, played before 1,456 fans at Racine, as one of the best games she saw. Before the 1947 season, Faut married former minor league pitcher Karl Winsch, who also came from East Greenville. The couple set up housekeeping in South Bend, and Jean worked in the off-season for Ball-Band, a local division of U.S. Rubber. On August 17, 1947, Ball-Band employees hosted a “Jean Faut Night” at Playland Park, home of the Blue Sox. In a pregame ceremony the excited pitcher was honored with many gifts, including a cedar chest. She capped the evening by hurling a two-hitter to beat the Kenosha Comets, 7-0. South Bend’s playoffs ended in early September. The Blue Sox lost in five games to Grand Rapids, and Jean Faut Winsch was two months pregnant. She gave birth to her first son, Larry, in March 1948. Nine years later she had Kevin, her only other child. Jean, already a housewife and an ace pitcher, now became a mother—all of which combined to make her baseball career more distinctive than most women, but more difficult to pursue. The majority of All-Americans remained single and enjoyed the social aspects of baseball, including road trips, dates, late-hour talk sessions, and card games. As a new mother in 1948, Faut missed the league’s spring training camp in Florida. It took her until mid-June to get into top condition, but she produced a fine season. Jean pitched 250 innings in 34 games, fashioning a 16-11 record with a 1.44 ERA. She ranked seventh among pitchers hurling 45 or more innings. Alice “Al” Haylett of Grand Rapids led the league’s pitchers with a 32-game record of 25-5 and a remarkable 0.77 ERA. On Saturday, September 4, 1948, Faut pitched her first no-hitter, beating the Belles at Racine, Wisconsin, 7-0. Except for walking three batters, she was in control all the way. The Belles hit four balls to the outfield, and all were easy outs. In South Bend’s first inning, second baseman Bonnie Baker led off with a single, center fielder Betty Wagoner advanced her with an infield out, shortstop Senaida “Shoo-Shoo” Wirth walked, and left fielder Elizabeth “Lib” Mahon doubled to left center, scoring both runs. The Blue Sox added a single run in the fifth and wrapped up the game with four more in the eighth. 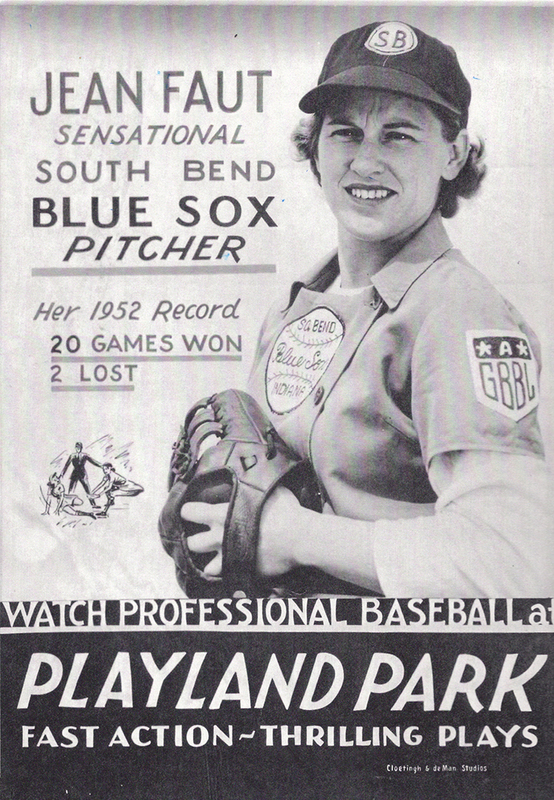 Also, South Bend’s Lillian Faralla had hurled a no-hitter against Racine on May 11, so two Blue Sox pitchers stumped the Belles in 1948. In 1949 Faut recorded her best season so far—and probably the best individual mark in the AAGPBL that summer. Her record was 24-8 with a 1.10 ERA. In 34 games she worked 261 innings, fanned 120, and walked 118. Nobody had more wins, and only two pitchers gave up fewer earned runs: Lois Florreich of Rockford, who was 22-7 with a 0.67 ERA in 269 innings, and Rockford’s Helen Nicol “Nicky” Fox, who was 13-8 and 0.98 in 212 innings. Faut led the AAGPBL in one category: 12 shutouts. Equally important, Jean paced the league’s hitters with a .291 average, even though her 117 at-bats (in 53 games) did not qualify her for the batting championship. Often used as a pinch-hitter when she wasn’t pitching, she scored 14 runs and contributed 21 RBI. Doris “Sammye” Sams of Muskegon, the league’s 1947 Player of the Year, won the award again in 1949, making her the first two-time winner. Sammye, an excellent athlete, a sidearming right-hander, and a hard-hitting outfielder when she wasn’t pitching, posted a 15-10 record and a 1.58 ERA in 211 innings. She led the league in batting with a .279 average in 406 at-bats. Throughout the 1949 season, South Bend, now managed by ex-major leaguer Dave Bancroft, waged an up-and-down battle with Rockford for first place. Although the Blue Sox had a four-game lead in August, the clubs tied with identical records of 75-36. On Saturday, September 3, 1949, in the final home game of the regular season at Playland Park, Faut gave a superb performance: she hurled her second no-hitter, a near-perfect game, and stopped Fort Wayne, 2-0. She walked Daisy shortstop Dottie Schroeder to open the eighth inning, but first baseman Vivian Kellogg grounded into a double play. Faut faced only 27 hitters, and only Schroeder reached first base. Further, Jean singled, stole second, and scored the first run on Betty Wagoner’s single in the third inning. In the sixth Jean accounted for South Bend’s second run with a sacrifice fly. In the playoffs, however, Rockford eliminated South Bend in four straight games. By edict of league president Max Carey, the playoff victory also made Rockford the regular season champion. 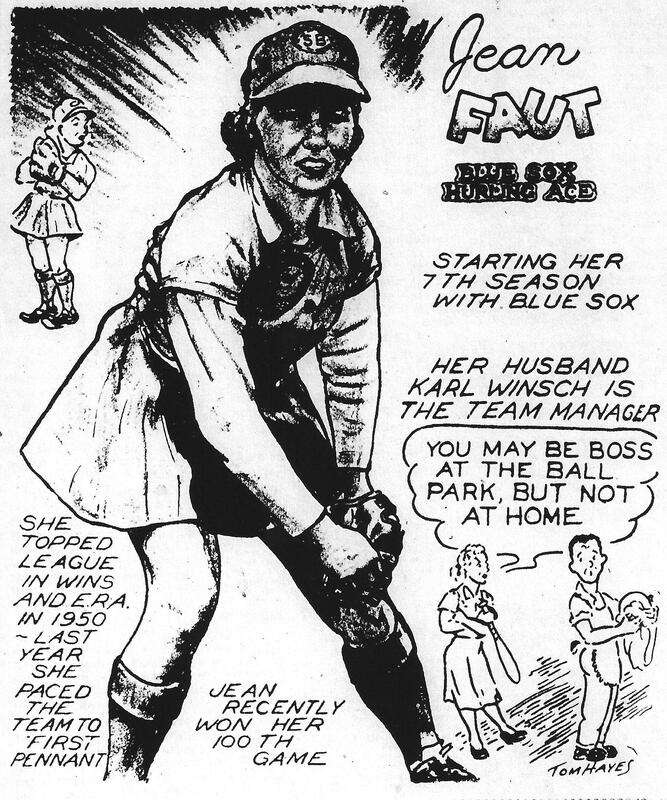 In her second full season as an overhand hurler, Faut had become the AAGPBL’s best pitcher. Although her excellent performance fell short of leading South Bend to a title, her team did climb from sixth place to a tie for first. Later, she produced four more fine seasons and led the Blue Sox to two championships. The record for her last five seasons reads like a highlight film. In 1950, however, most pitchers were still adjusting to the new 10-inch ball introduced on July 16, 1949. While Jean struck out 118 batters, she walked 104. Still, she led the league in ERA with 1.12, complete games with 29, innings pitched with 290, and batters faced with 1006. Fort Wayne’s Maxine Kline paced the circuit in wins with 23, and she had a 2.44 ERA. Batting averages jumped in 1950, because the new cork-center lively ball helped the hitters. Rookie Betty Foss of Fort Wayne set the pace at .346, and the Daisies averaged .249 as a team. Faut batted .217, going 43-for-198. She also scored 23 runs, stole 15 bases, and collected 26 RBI. In 1951 South Bend got a new manager, Karl Winsch, Faut’s husband. Perhaps to avoid charges of favoritism, Winsch pitched his wife in fewer games, 23 (down from 36), and less innings, 190 (down from 290). Still, Jean’s 1.33 ERA ranked third in the league, and her 15-7 record (her first five losses were by one run) helped South Bend win the regular season title. Faut was tough on the hard-hitting Peaches. Throwing mainly a fastball with zip and a sharp-breaking curve, the right-hander displayed excellent control. Reflecting later on her control, Jean explained that her foot always landed in the same spot when she completed her follow-through. A model of consistent motion, she also memorized the pitches that she threw to each batter, changing the sequence of pitches each time she faced the same hitter. In the bottom of the sixth South Bend scored the only two runs of the game. Third baseman Audrey Bleiler started the inning with a walk. Second baseman Charlene “Shorty” Pryer moved the runner along with a sacrifice bunt. When Rockford second sacker Bobbie Payne fumbled a grounder by Wagoner, Bleiler went to third. Shortstop Shoo-Shoo Wirth scored Bleiler with a squeeze bunt. Cleanup hitter Lib Mahon then smashed a vicious grounder down the line to Rockford’s All-Star first baseman Dot Kamenshek. Dot fielded the ball, stepped on first for the second out, and threw to second for an apparent double play on Wirth, who had rounded the base too far. But Bobbie Payne lost the throw, and Wagoner scored on the error. Ahead 2-0, Faut got tougher. She struck out five of the last nine hitters, finishing the game by fanning Rockford hurler Nicky Fox. Jean’s fired-up teammates swarmed her after the final out, carrying the ace right-hander off the field in triumph! Before the game, Faut had an 8-5 record, but all five losses came by one run. Quipped Lib Mahon, “I guess Jean figured she had to pitch a no-hitter for us to win a game for her”! Faut’s performance kept improving, the Blue Sox finished first in the second half of the regular season—and made the playoffs, and Jean was voted was voted Player of the Year in 1951. In the best-of-three first round of the Shaughnessy Playoffs, South Bend beat the Fort Wayne Daisies, two games to one. Faut pitched complete games and won the first and third contests, both by scores of 2-1. Scattering eight hits, she won the clincher in 10 innings. Fort Wayne’s Jean Weaver doubled in the ninth, and with two outs, she attempted to steal home but was tagged out at the plate. In the tenth Shirley Stovroff led off with a double. She moved to third on a sacrifice bunt. After Pat Scott gave intentional walks to Faut and Lib Mahon, first baseman Dot Mueller squeezed home the winning run with a perfect bunt. In the best-of-five championship round, defending AAGPBL champion Rockford won the first two games. On Saturday, September 8, at Fort Wayne’s Memorial Field, the Peaches beat the visiting Blue Sox, 5-4, behind the moundwork of Nicky Fox. South Bend rallied to score two runs in the eighth and one in the ninth, but fell short. In the second game on Sunday Rockford blasted South Bend starter Sue Kidd for three runs in the first inning, before Lou Arnold came in to stop the rally. Rose Gacioch pitched a six-hitter and slugged a solo home run to help the Peaches win, 7-1. Rockford led all the way, clinching the victory with three runs in the eighth inning. Rain prevented game three on Monday in South Bend. On Tuesday evening Faut pitched and led her team to a 3-2 victory, striking out 11 and walking two. Rookie Marie Mansfield, famed for her wildness, walked 13 South Bend batters but allowed only three hits. The Blue Sox won by scoring three unearned runs in the third, thanks to Stovroff’s single, Faut’s double, an error, two walks, and a hit batter. Faut, falling behind to most of Rockford’s hitters, proved superb in the clutch, allowing six hits, striking out the last batter in six innings, and fanning the side in the sixth. In the fourth game, also held at Playland Park, the Blue Sox won, 6-3, in a game shorted to seven innings by rain. South Bend’s Georgette “Jetty” Vincent outdueled Nicky Fox, allowing seven hits while her teammates collected 10. Rockford scored twice for a 3-0 lead in the top of the third, but South Bend scored once in the third and twice in the fourth to tie the game. The Blue Sox won with a three-run sixth inning, thanks to hits by Shorty Pryer, Shoo-Shoo Wirth, and Lib Mahon, along two errors, a walk, and a sacrifice. Shirley Stovroff led South Bend with three hits in four trips. With the Blue Sox leading 6-3, Jeep Stoll led off the home half of the seventh with a double, but a downpour ended the game at that point. In game five at Playland, Lil Faralla pitched against Rose Gacioch. The visitors scored an unearned run in the top the first inning, but the Blue Sox bounced back with five runs in the bottom of the first. Shorty Pryer led off with a Texas League double, and Betty Wagoner, who went 4-for-4, singled her home. Gacioch walked Shoo-Shoo Wirth and Shirley Stovroff to load the bases. Jean Faut’s line drive was misplayed for a two-run error, and Lib Mahon plated the fifth run with a sacrifice fly. South Bend pounded out 13 hits for the evening, winning the championship in a breeze, 10-2. Faut started the game at third base, but Faralla tired after two innings, and Jean pitched the reminder of the game, earning credit for the victory. Considering that Rockford had won nine straight games, including the first two games in the championship series, South Bend came away a surprise winner of the team’s first championship in the AAGPBL’s first nine years. South Bend combined good pitching with good hitting. Karl Winsch told the South Bend Tribune that the Blue Sox came from behind to win 24 games in 1951, compared to four in 1950. In addition to the standout pitching of Jean Faut, who won 15 games during the regular season and four more in the two playoffs, Betty Wagoner batted .600 (6-for-10), Shirley Stovroff hit .500, and Shorty Pryer averaged .357 in South Bend’s final three victories. In 1952 Jean, pitching her greatest during a summer of internal tension, produced an even better season. As Barbara Gregorich explained in her 1993 book Women at Play, there were groups of players who would not speak to the manager or to his wife. Karl Winsch, after a positive first season, evidently became increasingly tough in his treatment of players. Though she was caught in the middle, Faut refused to let the problems affect her on the field. Batting cleanup most of the year, she hit .291 (67-for-230) in 73 games, scoring 30 runs, driving home 32, and leading South Bend to a second-place regular season finish. On the mound Jean was even more dominant, posting a remarkable 20-2 record with a league-best 0.93 ERA. Her 20 regular season wins (she won three more and lost once in the playoffs) left her tied with Rockford’s Rose Gacioch, went 20-10 with a 1.88 ERA. Dissent within the South Bend club peaked on Saturday, August 30, just before the season ended. Five girls joined Shorty Pryer in a walkout. The incident occurred when Winsch suspended Pryer from the team after she responded slowly to his order to pinch-run late in Friday’s game. In the opening round of the Shaughnessy Playoffs, South Bend faced the Grand Rapids Chicks, who had beaten the Blue Sox in Grand Rapids in a double-header the night before. But Faut pitched this game and won, 2-1, spacing three hits and allowing an unearned run in the ninth, before pitching out of a bases-loaded jam. Betty Wagoner drove in a second-inning run with a single. First baseman Joyce Westerman, who singled in the eighth and moved to second on a passed ball, scored the winning run when Faut bunted, catcher Inez Voyce threw to third to catch Westerman, and the throw got away from third sacker Rene Youngberg. South Bend’s “dutiful dozen,” as the South Bend Tribune dubbed them, beat Grand Rapids again the following night when Sue Kidd, who played the outfield and third base when she didn’t pitch, scattered six hits for a 6-1 victory. Faut, playing third base, batted in two runs and saved the win by pitching a scoreless ninth. Moving on to the AAGPBL’s championship round, South Bend again faced perennially tough Rockford. On Saturday, September 6, Faut suffered an unusual off day. She yielded seven runs on 13 hits, topped by a two-run homer in the seventh inning off the bat of Eleanor Callow. The manager pulled Jean after the inning, but the damage was done. Rockford, cruising behind the pitching of Jackie Kelley, won, 7-3. Sunday’s game two in Rockford proved controversial. The field was being prepared for football, so the Peaches shortened the right field distance to 190 feet, 20 feet short of the league minimum. Karl Winsch filed a pre-game protest based on the field’s smaller size and the fact that Rockford management would not accept a ground rule covering the new fence. Rockford manager Bill Allington announced he would protest South Bend’s violation of the rule requiring a squad of at least 15 players, but he did not file his protest with the league. The Blue Sox took a 2-0 lead in the top of the first when Faut doubled home Jetty (Vincent) Mooney, who walked, and Jo Lenard, who singled. Rockford tied the score in the third on three hits, a stolen base, and a wild pitch. The Peaches won, 3-2, when catcher Ruth Richard broke the 2-2 tie in the fifth frame with a homer over the shortened right field fence. Richard’s blast helped Rose Gacioch edge South Bend’s Janet Rumsey in the pitching duel watched by 2,000 fans. Returning to Playland Park on Monday night, the Blue Sox won on the field, 5-4, in twelve innings, and off the field, as AAGPBL business manager Earl McCammon upheld Winsch and ordered a reply of the protested game. In Monday’s regular game, Sue Kidd pitched into the ninth and held a 4-2 edge, but she allowed a leadoff double by Eleanor Callow. Faut relieved Kidd and gave up two runs on three singles, one an infield chopper. But thereafter Jean dominated the Peaches, holding them scoreless for three innings. She earned the victory when Kidd singled in the bottom of the twelfth to break the 4-4 tie, scoring Joyce Westerman, who had singled and advanced on a walk and an infield out. On Tuesday evening at Playland, Rockford rebounded to win what became game three, 5-4. The Peaches took a 5-1 lead before the Blue Sox hitters got rolling, and Rockford made five double plays to kill several South Bend rallies. Jackie Kelley pitched the route and got the win for Rockford, and Jetty Mooney hurled for South Bend, suffering the loss. But two errors by the Blue Sox catcher Mary “Wimp” Baumgartner led to three of Rockford’s runs. Facing elimination, South Bend came back to win a 10-inning nail-biter the following evening, 2-1. Janet Rumsey started and hurled a complete game. She allowed the Peaches one unearned run in the fifth inning when first sacker Joyce Westerman failed to hold Rumsey’s throw on a pickoff attempt with runners on first and third base. The Blue Sox tied the score in the seventh when shortstop Gertie Dunn singled and went to second on an outfield error. Right fielder Marge Wenzell sacrificed Dunn to third base, and Wimp Baumgartner laid down a perfect squeeze bunt to score the run and tie the game at 1-1. South Bend won in the tenth on Joyce Westerman’s two-out RBI single. Baumgartner led off with a single, and Jan Rumsey sacrificed her to second. Betty Wagoner picked up an infield hit, moving Baumgartner to third, and Jetty Mooney walked. After Jo Lenard flied out to center field, Westerman smashed the game-winning single between the first and second basemen. On Thursday evening, September 11, at a neutral field in Freeport (Rockford’s home park was unavailable), Faut pitched one of her greatest games. She spaced eight hits in her fourth playoff appearance, and she slugged two huge triples to pace a 12-hit South Bend attack. The Blue Sox, officially the home team, took a 1-0 lead in the bottom of the first inning when Joyce Westerman doubled home Jetty Mooney, who had reached first on an infield error. South Bend scored three more runs in the second. Betty Wagoner singled to right field and took second on a throwing error. Mooney singled in the first run, and Jo Lenard followed with single. Lenard was forced out at second on Westerman’s ground ball. But with runners on first and third, Faut blasted a long triple to right center (the field had no fences) to put the Blue Sox ahead, 4-0. Rockford cut the deficit to 4-1 in the fourth on Snookie Doyle’s single, a walk to Eleanor Callow, and an error by South Bend’s Marge Wenzell. But the Blue Sox bounced back in the sixth frame. Faut hit a long triple to deep center, and she scored the fifth run on Gertie Dunn’s groundout. In the seventh Wagoner singled, Lenard singled, and Westerman laid down a squeeze bunt to score another run, giving the Blue Sox a 6-1 lead. Worn out by the ninth, Faut was pitching on determination and heart. She gave up a triple and two singles and yielded two runs. In the end, she retired Joan Berger for the season’s final out and South Bend’s second championship. “My second triple could have been a home run,” Faut recalled, laughing about the memory. “I could have beaten the throw, but I was so exhausted after I rounded third base that I turned and walked back, and I sat down on the bag! Rumsey remembered the Blue Sox having multi-talented girls who played other positions and together they won the team’s second title. The so-called Dutiful Dozen, pictured by the South Bend Tribune on September 12, 1952, were Faut; Rumsey; shortstop Gertie Dunn; pitcher Lou Arnold; outfielder Betty Wagoner; pitcher and second baseman Jetty Mooney; rookie outfielder Mary Froning; outfielder Jo Lenard; catcher Mary Baumgartner; first baseman Joyce Westerman; Sue Kidd, pitcher and outfielder; and infielder-outfielder Marge Wenzell. Baumgartner observed in 1995 that Faut was one of the most talented, competitive, and inspiring players in the league: “Throughout my career as her battery mate,” Wimp recalled, “I was continually inspired and encouraged to play all out. By that I mean I was instructed by Jean to try pick-off plays, throw the ball, and damn the torpedoes. I learned not to hesitate, but to fire the ball on all steals and anything else that looked tempting with runners wandering around. Faut came back for her final season in 1953. Once again she was voted Player of the Year, although South Bend finished fifth, missing the playoffs. Still, Jean produced a league-best 1.51 ERA and a 17-11 record. She tied for tops in wins with Eleanor Moore of Grand Rapids, who went 17-7 with a 2.00 ERA. Faut also hit .275 (87-for-316), with 11 doubles, one triple, and a career-high four home runs, while scoring 33 runs and driving in 38. The Blue Sox season highlight came with her second perfect game. On September 3 in Kalamazoo, Jean blanked the Lassies, 4-0. Her finale came that Sunday at Playland, when the Blue Sox and 1,500 fans once again honored her with a Jean Faut Night, showering her with $400 in merchandise. Unfortunately, she lost to Grand Rapids, 3-0. Instead, she began bowling, which she could do in the evenings after work. With her talent, motivation, and dedication, the former diamond star had turned professional by 1960. She bowled for years on the women’s pro tour. Jean was divorced from Karl Winsch in 1968. Living and working in South Bend, she met Charles Eastman, a salesman for Textron Corporation, in 1977. They married and enjoyed several good years together before he passed away. During that time Jean learned to golf. A vigorous grandmother with four grandchildren, she golfed for years. Faut had a fierce competitive spirit. At AAGPBL Reunions, when the women would reminisce about their once seemingly endless summers, she would often ask: If you had it all to do over again, would you play any better? Jean’s answer was that she couldn’t, because she gave South Bend and the All-American her greatest effort every day. She tried her best to live the impossible dream: fulfilling the feminine “All-American girl” image while playing big-time hardball and being a wife and mother. In addition to being an extraordinary person, the former Blue Sox star was the All-American League’s most dominant pitcher after 1948. A two-time Player of the Year who led her team to two championships, Jean Faut was the All-American League’s ace of diamonds.